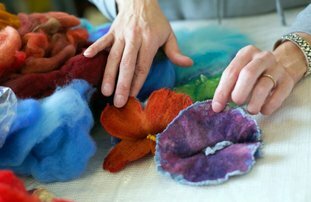 This workshop will introduce participants to the world of wet felting by exploring color, design, and texture through the creation of a 3-D wet felted flower. verything you need to produce at least one completed flower pin, along with written/photo instructions to make more, are included in the workshoptuition/materials price of $35. Due to studio size, space is limited to a maximum of 6 participants for each workshop.